The Museum of Archeology and Ceramics of Montelupo intends to collect, preserve and spread any document which serves to deepen the knowledge of ceramic production, both in Montelupo and in any other territorial area, and of any other aspect connected to the material culture, the civil and moral life of the populations which lived in the territory of the current Municipality of Montelupo Fiorentino and the neighboring areas. The museum exhibits numerous local archeological finds from pre-history to the end of the Middle Ages and locally manufactured ceramics discovered in the urban excavations. 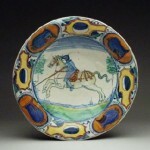 The section of the exhibition reserved for ceramics presents a wide selection of more than 3,000 restored examples which are part of the internal collections and document in its various aspects the activity of the local workshops from the late Middle Ages to the end of the Modern Age, testifying to the orders of great importance which were placed to the kilns of Montelupo and which gave vent to a vast production of great decorative value. the appropriate didactic-explanatory sections introduce the visitor to the subjects dealt with in each exhibition section. Near the institute there is an ancient ceramic kiln, where the typical work environment of the pre-industrial period is still visible. (It may be visited following the didactic itineraries). Since 1989 an archeological excavation has been started by the Museum, which has brought to light a large Roman country villa of the 1st century B.C., near the Virginio stream (aerial photo of the Roman villa). The intrinsic characteristics of the premises, its dimensions and the chronology of its foundation itself place it in the slave villa category, a phenomenon which did not seem to go further north along the Tyrrhenian coast than the southern part of Tuscany. In order to understand Montelupo’s history, it is necessary to connect the events concerning thepresent town of Montelupo to the two most important factors of its dependence on Florence and the development of its ceramic production: in fact, both factors contributed decisively both to the rise of the settlement in the form of “walled land” (that is, of a town secured by walls) and its subsequent development. Between the 12th and 13th centuries, at the time in which the Lilied City (Florence) began the conquest of the surrounding territories, the population rate of the Montelupo area was rather low and concentrated around a defensive tower dependent on Capraia, the powerful castle of the Counts Alberti on the other side of the Arno. When the Alberti tower was destroyed in 1203, the Florentines immediately enlarged the ancient settlement, reuniting the surrounding population inside it. At the end of the 1200’s, they added to the new castle a large rectangular area which stretched from the top to the bottom of the hill, thus joining a small pre-existing village, which had been built near a Roman bridge which right there linked the two banks of the river. In the early fiscal documents (1350) available to us, one can, in fact, already observe how the town of Montelupo was divided into “Castle” – a placename limited to the hill’s summit and part of the original settlement – and “Village” – name which defined the subsequent enlargement, so called even if surrounded by walls. After the years of the demographic crisis (1340-1450), Montelupo had a new increase in the built-up area, and the growth of the settlement attracted immigrants even from distant places, according to a process that has constantly characterized the history of this “walled land”. 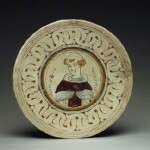 The ceramics production, in fact, came to be concentrated within the walls of the “new Montelupo” on the basis of a likely previous activity which took place in the inhabited centers scattered along the left bank of the Arno. 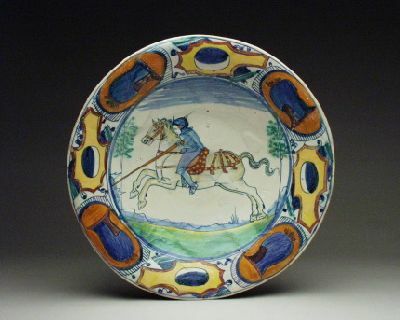 With the Florentine conquest of Pisa (1406) Montelupo came to enjoy an enviable position along the principal commercial road to Florence; the location of this “walled land” on the privileged axis of the city’s international exchanges, in fact, allowed the Montelupo potters to easily send their own ceramics to the Florentine merchants’ warehouses in Pisa (and later on in Leghorn), from where they were easily marketed as part of the cargo of ships involved in the maritime trade occurring between the Tyrrhenian coast and the Iberian-Provençal world, which also greatly involved Corsica and Sardinia. 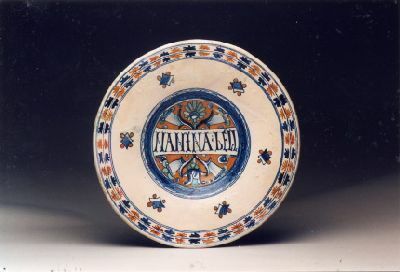 The contemporary development of ceramic production both in eastern Spain and, in particular,in the great ceramic center of Manises, whose products were mixed with those of Montelupo in the Mediterranean trading centers, forced the Valdarno ceramists to a sharp confrontation with the great Arab-Hispanic tradition, of which the Valencian potters represented the latest, seasoned exponents. 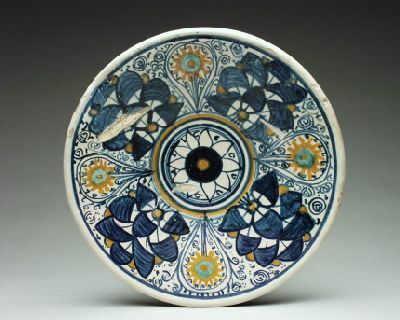 The fantastic Spanish repertory, which counted on the use of metallic luster, and was based on the grand Gothic-Mudejar decorative tradition, imposed a constant chromatic and decorative evolution on the handiwork of the Montelupo potters, necessary in order to compete on the market with these extraordinary objects. Motifs taken from the Iberian repertory penetrated widely into the Montelupo pictorial language of the years 1410-70, as well as a decoration structure which was dependent on the many examples of ceramics with “Islamic” roots spread also in the eastern Mediterranean at that time: in fact , in the sources, the best production of the period is named “damascene”, (from Damascus, Syria, a center of decorative arts but also a large market for oriental ceramics). Meanwhile an economic development recovery gave vent in Florence to a rapid urban growth that, after 1450, also enlivened a strong economic recovery. The city’s institutions and its leading classes gradually established preferential relations with the potters of the countryside; as a consequence many families of Montelupo ceramists benefited from the direct sales to new clients and in order to better develop such relations, some Montelupo ceramists, as well as their colleagues from Bacchereto, transferred their workshops to Florence, especially near the city gates of San Piero Gattolino and San Niccolò. Production during the years 1440-60 showed a rapid abandonment of the old decorative schemes of the “damascene” and a search for a new formal language that would be the basis of the subsequent Renaissance style. 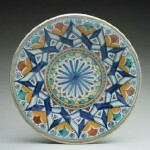 While, in fact, the evolution of the “archaic majolica”, painted with copper flake and manganese came to a halt, and the production of the “”zaffer relief” (photo 4) gradually ceased , the damascene chromatic palette was enriched with new tones and the principal themes turned to the representation of realistic forms. The generation of painters that were active in the twenty years around the half of the 15th century started those new formal conquests which were then accomplished by their successors through the ultimate development of polychromy and a new structural codification of space. 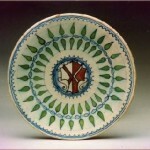 The Montelupo ceramists in the years 1470-80 introduced a precise hierarchy in their decorations, rigorously dividing the border motifs from the principal representations through artifice such as: the use of a stylized garland or, more simply, the confinement of accessory parts into proper sectors; in such a way, they broke once and for all with the Islamic tradition, which they had assimilated through the example of the Spanish majolica and they gradually came to the pictorial language of the Renaissance. The central figures, more and more well-constructed in complex scenes, were inserted in naturalistic environments through which the ceramists established, thanks to skilled tricks of perspective, new and refined spatial relationships. 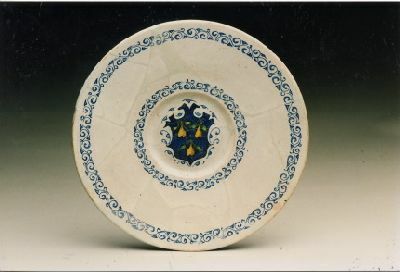 The beginning of the golden age of enameled production in Montelupo, under both a qualitative and quantitative point of view, can be set between 1470 and 1500. This phase of the local workshops’ generalized growth extended to about 1530. 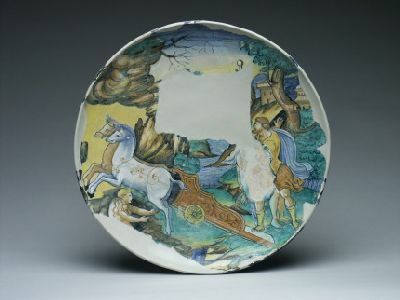 In this phase, in addition to the complete development of the early Renaissance style , there was also the massive introduction of Florentine mercantile capital into the ceramics activities in Montelupo. 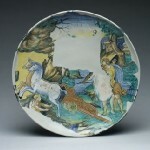 Of this remains an eloquent contract signed, in September 1490, by Francesco degli Antinori with 23 local master potters; with that deed Antinori bound himself to buy their entire production for three years and to pay them according to the prices fixed for three bands of quality: ordinary (the old archaic majolica and its modernization), damascene (the typologies – now evolved – that fell under the Spanish imitation and oriental motif terminologies) and the “vantaggino” / valuable (the new polychrome Renaissance production). 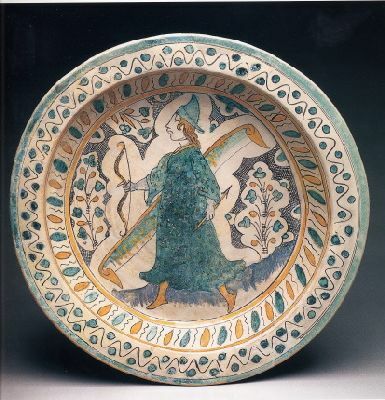 The development of production activities that came from the union of the local Potter’s Art and mercantile capital can be verified through the exponential increase in the export of Montelupo’s ceramics related to the years 1490-1520, which was visible not only in the entire Mediterranean basin (from Greece to Morocco, from Southern France to Spain), but also along the Atlantic route that led to southern England (London, Southampton) and Holland (Amsterdam), but also as far as Norway. 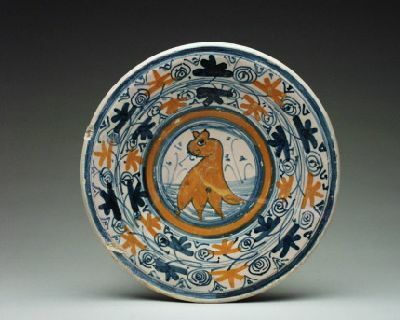 This period also saw new migrations of the Valdarno potters which were documented in Lyons, in Provence, in Siena and increasingly in Rome. In addition, at the end of the 15th century, Piero and Stefano “Fattorini” transferred to the Medicean villa of Cafaggiolo in the Mugello to start one of the most famous and important factories of the Renaissance. The market difficulties connected with the inflationary increase in the 16th century, already considerable by the half of that century, caused a first period of stagnation in the local production; after 1590, in connection with the incipient economic crisis in Tuscany , which grew considerably worse during the years 1618-21, Montelupo’s ceramic production began its slow but inexorable decline. The terrible pandemic plague of 1630-32 dealt an almost fatal blow to the Montelupo ceramic enterprises which hardly recovered from it also considering the flight of Florentine capital from the local businesses. 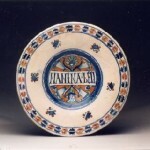 Between the second half of the 1600’s and the end of the next one, Montelupo thus lost almost all its previously acquired strength as a production center of majolica However, in the meantime, the diversification of its activities, by increasing the manufacture of terracotta (oil jars, basins, pots), which the village of Samminiatello had already been producing for some time, and around the beginning of 1720, brought to a large production of cooking pots and pans in Montelupo. 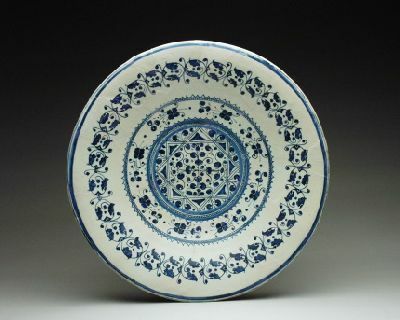 Reduced to its lowest level between the 1700’s and the 1800’s, the manufacture of dishes was later revived in the Montelupo area, by the Bardi kiln, set in the near-by town of Capraia, which seems to have begun production during the 1740’s, thanks also to the contribution given by the Fanciullacci family, expert ceramists who had left the Doccia factory in Sesto Fiorentino. 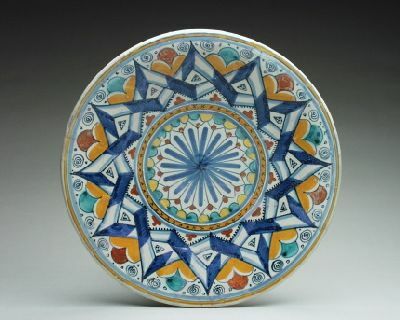 It was the Fanciullacci family, who in the meanwhile had acquired legal ownership of the company through their transfer to Montelupo in 1911, to determine a resumption of production of majolica in Montelupo, from which the present-day businesses can be said to derive. L’arte di lavorare il vetro nella tradizione Empolese. Alderighi R., Ciani G., Viti Pagni S. ( a cura di), Pontedera, Editore: BANDECCHI & VIVALDI, 1999. Tourist guide to the area around Empoli and the Valdelsa. AA.VV., non disponibile, Editore: The Association of Township. 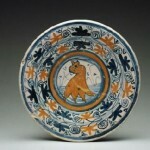 Storia della ceramica di Montelupo. Uomini e fornaci in un centro di produzione dal XIV al XVIII secolo. Berti F., Montelupo Fiorentino, Editore: Ed. AEDO. Size: max. diam. 25.5 cm. ; foot: diam. 11.5 cm., h.: 5.3 cm. Historiated – Low-footed fruitstand. 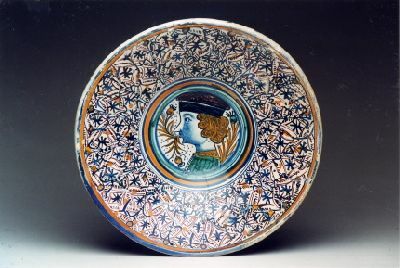 Pluto abducting Persephone is depicted on the bowl’s interior; the exterior decoration shows stylized plant motifs in cobalt blue. The Trident mark is under the foot. Size: max. diam. 16.1 cm. ; foot: diam. 11 cm. ; max. h. 26.2 cm. 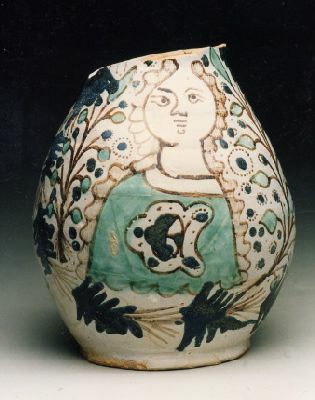 Fully-developed floral – trefoil jug. 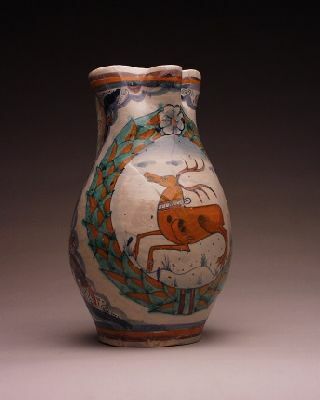 On the front is a running deer surrounded by a floral wreath. The sides have a blue and orange motif of twisted leaves. Size: max. diam. 10 cm. ; foot: diam. 8.8 cm. ; max. h. 19.5 cm. 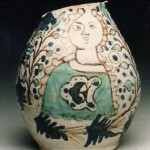 “Grotesque” decoration – Small jug with a flattened globular body on a broad flared base. 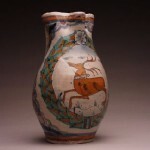 It has a high cylindrical neck with spout and a rolled-handle set at the widest point above the lip. The decorations are in yellow and deep or watered-down blues. Size: max. diam. 34 cm. ; foot: diam. 13.2 cm. ; h. max.5.7 cm. 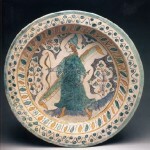 Weapons and Shields – Large dish. Typical decorations on the rim with horse-head shields in yellow with red edging, alternating with rusty orange ovals with stylized helmets in the center. Size: max. diam. 35.2 cm; foot: diam. 12.8 cm. ; max. h. 8.5 cm. Parsley leaves – Large plate. The parsley-leaf decoration contains the figure of a lion rampant. Size: max. diam. 20.5 cm. ; foot: diam. 8 cm. ; remaining h,: 2.5 cm. 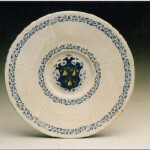 Atypical decorations with coats-of-arms – Dish with a folded, rounded edge. 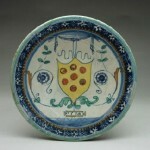 Decoration with crown of lanceolate leaves that hold the Fieravanti family’s brown and red coat-of-arms in the centre. Size: max. diam. 24.9 cm; foot: diam. 8.5 cm. ; max. h. 3.3. cm. Imitation metallic luster – Dish with rounded edge. The decoration consists of an orange circle in the center from which four sectors delimited by cobalt blue stripes branch off. Size: max. diam. 33.4 cm. ; foot: diam. 14.8 cm; max. h. 6.6 cm. Band with oval and diamond shapes – Dish with rounded edge. The rim has a band with oval and diamond shapes ringed by two blue lines. In the center is a checkerboard pattern in alternating red, green, and white. Size: max. diam. 22 cm. ; foot: diam. 8.8 cm. ; max. h. 4 cm. 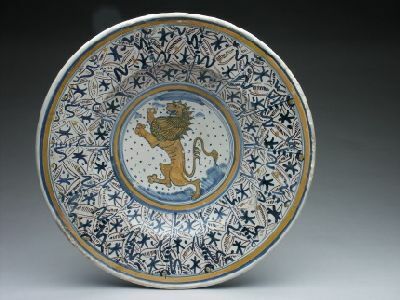 Persian Palmette – Rounded-edge dish. 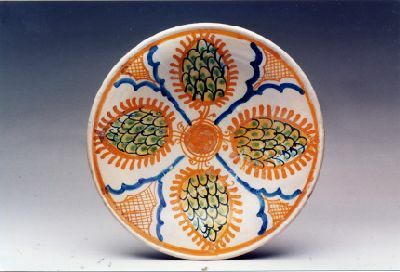 The typical palmette motif on the rim alternates with a flower enclosed within blue lines. A stylized floral corolla is at the center. 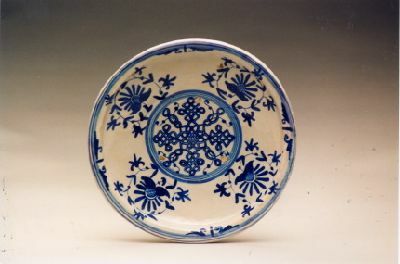 “Famille bleu” and “oriental knot” plant motifs – bowl-shaped dish with a narrow rim. 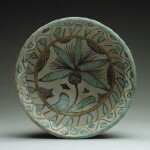 The design consists of a flower motif with a leafed branch that is repeated along the rim. An oriental knot is enclosed by circles in the center. Blue relief – Truncated cone-shaped basin. 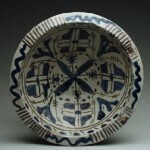 Decorated with a geometric phytomorphic motif quartered on the sides. A plant inflorescence with petals opened in the cross is in the center. Size: max. diam. 15 cm. ; foot: diam. 9 cm; max. h. 25.5 cm. 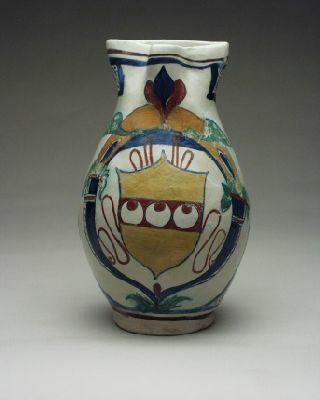 Band with ovals and lozenges – trefoil jug with an egg-shaped body. 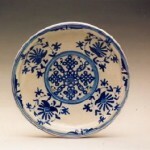 Decorated with a border motif of ovals and lozenges. The Strozzi coat-of-arms is in the center inside a diamonded ring with feathers and cornucopias. The “Go” mark is located where the handle attaches. Size: max. diam. 20.5 cm. ; foot: diam. 10.5 cm. ; max. h. 8.4 cm. 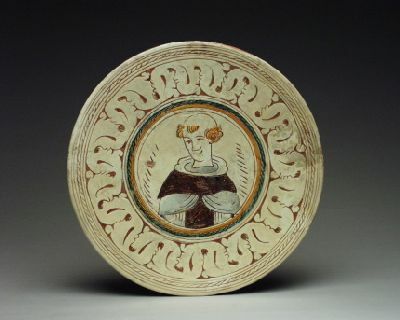 This bowl belongs to an impagliata, or parturition set. 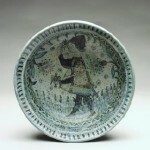 At its center, the prevalently blue decoration presents the figure of a young man holding a bird (a hawk?) in his right hand. 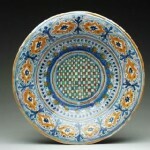 The rim is decorated with short blue vertical stripes. Size: max. diam. 35.5 cm. ; foot: diam. 18.5 cm. ; max. h. 6 cm. Derivation of the imitation Valencian leaf pattern – Large plate with rounded edge. 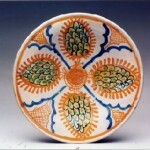 Encircled with stylized ivy leaves in alternating blue and orange set close to the rim. In the center is a central band with the inscription “Nanina bell[a]”. Size: max. diam. 25 cm. ; foot: diam. 9 cm. ; max. h. 2 cm. 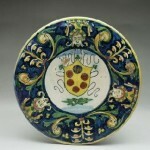 Grotesques – Dish whose central decoration is a (Medici) coat-of-arms in red and blue on a yellow background. 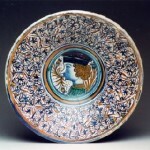 Grotesques on a blue background decorate the rim. Size: diam. max: 22 cm. ; foot: diam. 9 cm. ; max. h. 2.8 cm. 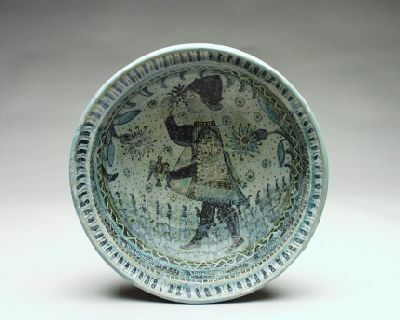 Blue graffito band – Dish with rounded edge. 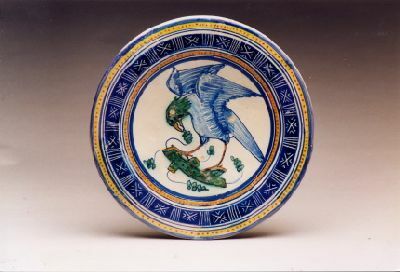 The band decoration surrounds the figure of a falcon pecking at a budding log. (Personal emblem of Filippo Strozzi). Size: max. diam. 26.7 cm. ; foot: diam. 13 cm. ; max. h. 3.5 cm. Famille bleu compendiario-style – Dish with rounded edge. 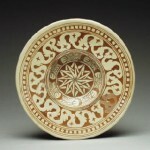 The stylized floral motif decoration stretches over the entire surface of the rim. 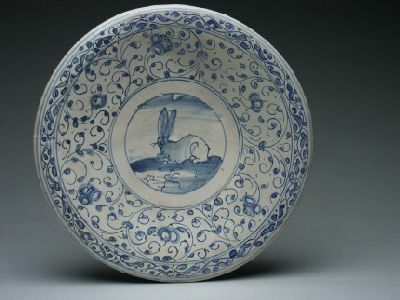 A white space separates this decoration from the center where a hare is depicted. Size: max. diam. 23.5 cm. ; foot: diam. 10.4 cm. ; max. h. 2.1 cm. Slip-glazed and graffito. 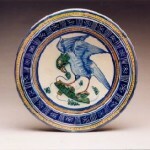 Genre 12b Scored plumage – Dish with rounded edge. The half-length figure of a friar is portrayed in the center. 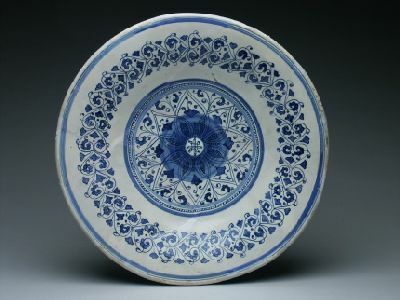 Blue graffito decoration – Plate with folded, rounded edge. 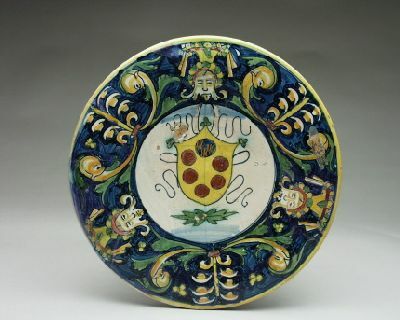 Decorated with an incised blue band and a Medici coat-of-arms among plant motifs, on a plaque dated 1514. Size: max. diam. 24.9 cm; foot: diam. 8.5 cm. ; max. h. 3.3 cm. 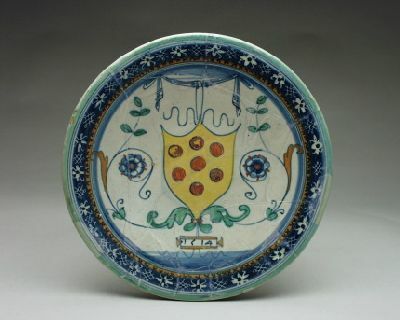 “Famille bleu” compendiario-style – Wide-rimmed bowl-shaped dish with the Peruzzi family coat-of-arms in the center. Size: max. diam. 20 cm. ; foot: diam. 9.7 cm. ; h,. 23.4 cm. 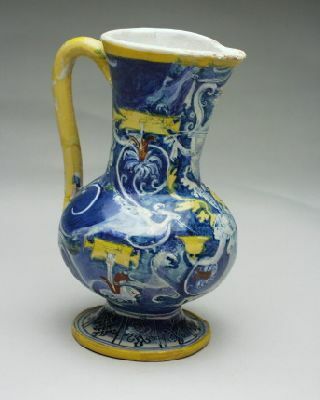 Tricolor zaffre – A broken jug with an egg-shaped body. It is decorated with two large plant branches and an oak leaf wreath that surrounds a half-length female figure. Size: max. diam. 12.6 cm; foot: diam. 8.5 cm. ; max. h. 19 cm. 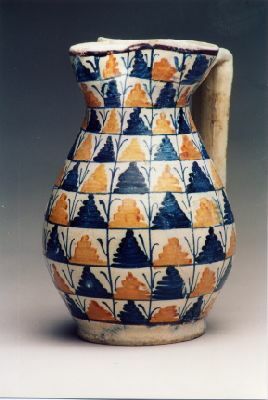 Imitation Valencian leaf pattern – trefoil jug. The grid formed by orthogonal lines in blue is filled with stylized leaves in alternating colors of orange and blue. Size: max. diam. 14.5 cm. ; foot: diam. 7.9 cm. ; max. h. 7 cm. 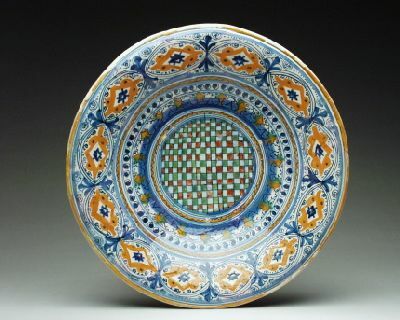 Tricolor archaic majolica – Bowl with a high rim. 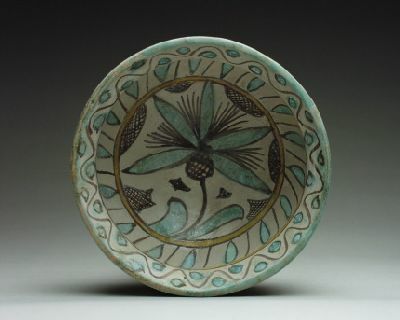 Decoration: on the bottom is a flower with elongated petals surrounded by a yellow circle and a trellis in manganese. A succession of lanceolate leaves is arranged vertically on the side. Size: max. diam. 34.8 cm; foot: diam. 16.5 cm. ; max. h. 5.5 cm. 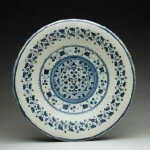 “Famille bleu” plant motifs – Large plate with rounded edge. On the rim is a band with a porcelain flower sprig. A stylized floral motif is in the center. Size: max. diam. 26.5 cm. ; foot: diam. 11 cm; max. h. 4 cm. 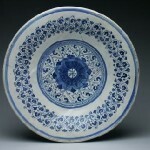 The monochrome blue decoration is characterized by a garland chain placed in the middle of the rim. Size: max. diam. 27.8 cm. ; foot: diam. 11.4 cm. ; max. h. 4.4. cm. Ribbons – Dish with rounded edge. The design consists of two overlapping and intertwined ribbons. Size: max. diam. 35 cm; foot: diam. 14 cm. ; remaining h.: 6.9 cm. Parsley leaves – Large dish with rounded edge. The parsley-leaf decoration contains the half-length profile of a man in a hat in the middle. Size: max. diam. 20.8 cm; foot: diam. 9.8 cm. ; max. h. 3.5 cm. 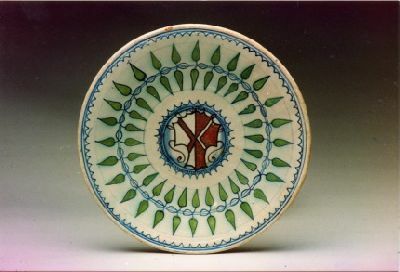 Derivation of the imitation Valencian leaf pattern – Dish with rounded edge. On the rim, there is a double-leaf branch in alternating blue and orange. A stylized animal is in the center. Size: max. diam. 21 cm. ; foot: diam. 7 cm. ; max. h. 3.3 cm. Slip-glazed and graffito. 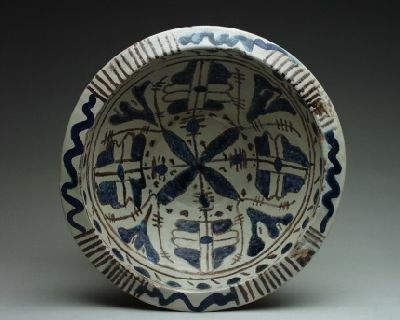 Genre 12b Scored plumage – Bowl-shaped dish with rounded edge. 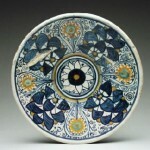 In the center is a stylized floral corolla motif surrounded by a band with a flowering branch. Size: max. diam. 46 cm. ; foot: diam. 33.1 cm. ; max. h. 7.4 cm. 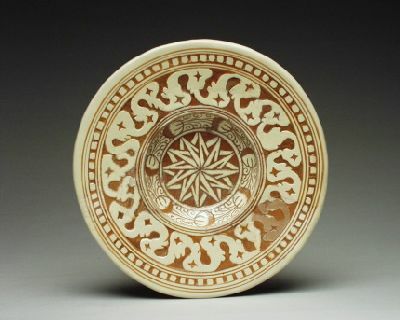 The internal decoration has the figure of an archer enclosed first by a band with a whorl motif and secondly by a zigzag line alternating with small circles. By car: Take the A1 motorway exit at Signa and take the SCG FI-PI-LI (towards Pisa). Exit at Montelupo. By bus: from Florence (Piazza Adua) bus service. from Tuesday to Sunday from 10 a.m. to 6 p.m.
Also closed on: Easter, Assumption, Christmas Day, and New Year ’s Day. Open on Easter Monday. The museum is open by appointment. You can book by email or by phone +39 370 330 5087. Closed on Easter, 1 May, 24 December, Christmas Day, 31 December, New Year’s Day. Free admission: children up to 6 years, Montelupo school students, Montelupo citizens over the age of 65, Cultural Heritage officials, G.A.M. members with a guest, license guides, escorts of differently abled visitors, journalists, Amici del Museo card holders and their guests, M Card holders and their guests, escorts of M Card Gift One+One users, Gift Free Card holders. The Museum is 90% wheelchair-accessible. There is parking for the differently abled at the museum’s entrance. Access to the museum is free of obstacles and stairs. Internal mobility is ensured by a lift.